www.Valspicer.co.uk - Val Spicer - Welcome! Topics: Design, Ask Val, Where To Buy, Wholesalers, and Floral Foam. 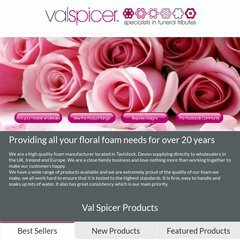 valspicer.co.uk vals spicer - floral foam - Val Spicer - Welcome! It is hosted by Heart Internet Ltd England, using Apache/2 web server. The site is programmed for PHP/5.2.17. Its 2 nameservers are ns2.ddholdingpage.co.uk, and ns0.ddholdingpage.co.uk. PING (79.170.44.110) 56(84) bytes of data.